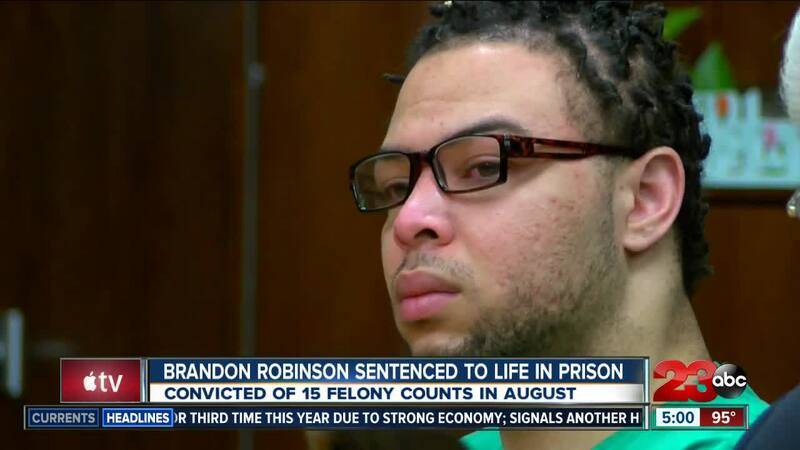 Brandon Robinson was sentenced to life in prison without the possibility of parole plus 19 year and 8 months after being convicted of 15 counts related to three sexual assaults. Robinson was convicted in August of 15 felony counts arising from three separate sexual assaults on three different women between the dates of March 3, 2017 and May 11, 2017. According to court documents, the convictions include felony violations of sexual assault, forcible oral copulation, forcible sexual penetration, kidnapping, robbery and criminal threats. At the time of the incidents, Robinson admitted to Bakersfield Police he was the suspect involved in all three cases being investigated, according to the documents. However, in an interview 23ABC did with Robinson in May 2017, Robinson said he did not commit the crimes.